NZ Police believes every New Zealander has the right to ‘be safe and feel safe’. Modern police stations need to support team work and communication, as well as integrating with their communities, so police can better keep those communities safer. A recent RDT Pacific project is helping Central North Island Police do this and more. The previous Rotorua Police Station was built in 1967. In addition to ongoing operational and maintenance costs associated with its age, the building suffered from poor layout and lack of appropriate space. Ad hoc modifications had scattered staff among small, disconnected offices, hampering communication and coordination. A new purpose-built police station and DHQ was completed this year to increase operational efficiency by enabling natural operational synergies among units, to reduce risks to staff and community through inappropriate facilities and to increase interaction among staff, partner agencies and the Rotorua community. To give the new building a strong sense of place, award winning Te Arawa artist Lyonel Grant was engaged to create a large screen symbolic of a korowai (cloak) populated by taniwha (guardians), signalling the station as a place of safety and protection. Lyonel also incorporated Maori designs throughout the building, including large sections of etched glass at the entrance. Meeting points of varying formality throughout the new building facilitate interaction and chance conversations. The public area is large, open and welcoming. Innovative features also provide easier access and a more welcoming environment for victims and witnesses. Witness interview rooms and break-out rooms feature rounded tables with “stowaway” computer screens that create a range of non-confrontational seating configurations. The building layout reduces the risk of a victim or witness encountering an offender, by situating their spaces on opposing sides of a policing ‘hub’, with separate entrances. The police themselves have played a significant role in shaping the building. Some of these innovations and ideas have been adopted nationally, influencing the design of other new stations – to support flexibility for future change and improve coordination, prioritisation, and case investigation timelines. The building meets the very demanding ‘Importance Level 4’ standard: to remain fully functional following a major seismic event. Earthquake resistant elements include PRESSS (PREcast Seismic Structural System), which uses un-bonded tensioning cables, allowing the building to flex and move in an earthquake. If needed, the building can also be temporarily self-sufficient in power generation, water and sewerage storage. The new Station had to integrate seamlessly with the existing custodial facility on the current site. This meant significant work to overcome challenging geotechnical issues, such as the potential for liquefaction, ground settlement and geo-thermal gas leakage. RDT Pacific has a strong track record for delivering NZ Police projects, and managed the project from the outset. Director David Prentice preparing a detailed business case, facilitating the design process and invaluable user group engagement, demolition, excavation and ground work. Senior Project Manager Sheryl Kirner helped to kick the project off, moved staff from four different locations into temporary accommodation and later helped them settle in to their new premises. Senior Project Manager John Meredith held regular project control group and site meetings to keep construction on track. With Stages 2 and 3 also recently completed, the main building has been exceeding expectations for the last few months. It’s enabling natural synergies among teams, it’s safer, thanks to a fit-for-purpose layout; and it encourages interaction with partner agencies and the community. It’s also highly flexible to change and growth, and represents a sound investment through reduced operating expenses and optimised value. 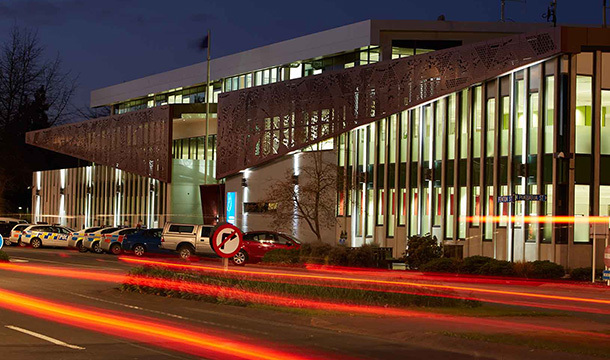 This flagship Police Station is already an iconic presence in the Rotorua City centre. The new premises offers local police an opportunity to ‘do a whole lot of things better’: to better serve victims of crime, the general public and each other.